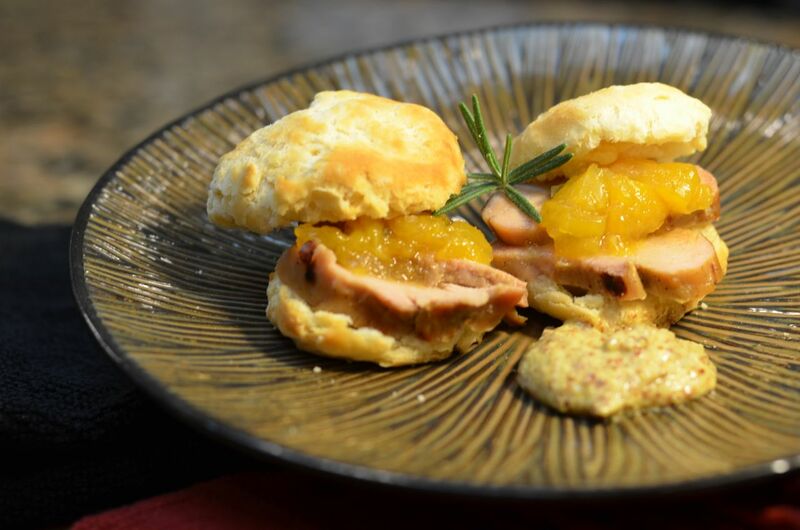 Party Pork Tenderloin with Jalapeño Peach Sauce and Tea Biscuits | Mary Duke Cooks! Aaaah, holiday travel can be challenging! Five years ago I had a folder full of directions to family and friends houses. Today I have a Garmin. We originally called her “Miss Bossy.” Being directionally challenged, I used to have a love affair with her. That was before we took her on family trips. Doc and I didn’t like how she screamed at us when we didn’t follow her directions so we gave her a British accent. That worked for a while. We would be happily following the blue arrow on the map when we would make a wrong turn and she would scream, “RECALCULATING!” While “Miss Bossy” was recalculating, (she’s a little slow) we would make one wrong turn after another. All the while “Miss Bossy” is screaming, “RECALCULATING, RECALCULATING, RECALCULATING” The map now displays zigzag red lines (hellooo, you’re going the wrong direction) and we are lost! That was when we changed her name to an acronym for the letter “B.” (Think irritating)! I shut her up last week… Turned off her voice… She can’t scream at us anymore! I don’t know about you, but many times when I attend holiday parties the majority of the appetizers are dips or something made with cheese! Doc always says, “Where’s the meat?” This appetizer can be eaten while standing, juggling a plate and drink! It is also a great game day snack. In a large stockpot bring water, Kosher salt and brown sugar to a boil, stirring to dissolve salt and sugar. Cool to room temperature then place brine in the refrigerator to cool completely. Add Pork tenderloins to the stockpot and brine for 2 hours, no longer, or pork will have a spongy texture. Remove pork from brine, rinse, then pat dry with paper towels. Season with salt and pepper. Heat grill. Choose from the following options. Option #1- Cook until internal temperature is 160 degrees F. Let rest 10 minutes, slice and serve immediately. Or Option #2 for advance preparation: Cook until internal temperature reaches 145 degrees F. Let rest 10 minutes then slice. Place the sliced pork and any meat juices in an oven safe baking dish. Cover with foil. Refrigerate. To reheat: Bake, 300 degrees F for 30 minutes or until meat is hot and cooked through. Serve with Peach Jalapeno Sauce, whole grain mustard and tea biscuits (I used Mrs. B’s tea biscuits). PS- You can use the rest of the jar of chutney as a glaze while grilling. With a sharp knife, cut peaches up (small dice) inside the can. Pour cut peaches and juice into a small saucepan and add the rest of the ingredients. Bring the mixture to a simmer then reduce heat to low. Cook for approximately 25 to 30 minutes or until the onions are cooked and the sauce thickens. About 2 cups.